GamesMaster Magazine has the first delicious details on the recently announced Resident Evil Revelations 2, the most telling of which are the game's two lead protagonists. Claire Redfield, who made it big in the series back with Resident Evil 2, returns after being dormant from the main timeline since its leap into the 6th gaming generation, Resident Evil: Code Veronica. GamesMaster Magazine's reveal shows that the fan favorite protagonist has aged quite a bit since her last appearance, and she is now playing the role of big sister. 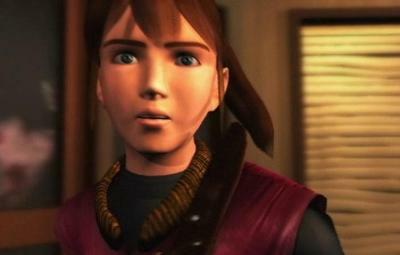 Redfield teams up with first-time protagonist Moira Burton, the daughter of Barry Burton. Burton remains popular among Resident Evil fans despite only making one canonical appearance as Jill Valentine's partner in the first game, but this lasting reputation can mostly be blamed on the first Resident Evil's horrible acting and dialogue. It makes you wonder if his daughter Moira is up to the task of filling Daddy's shoes. I'd like to think so, but seeing how video game voice acting and writing has "evolved" into totally straight, flatlined filler since the PlayStation days, that original charm of three month old cheese that once made Resident Evil so much fun is no longer in style. My guess is she'll be textbook "Young Video Game Girl 101." In the series' canon, Resident Evil Revelations 2 takes place between Resident Evil 5 and Resident Evil 6. It will be a single player game with the option for co-op, meaning it sticks to the trends that made Resident Evil 5 such a huge hit. The action will revolve around Claire, and Moira will mostly be there for back-up support. I only hope that the team behind it, the same responsible for the fabulous Resident Evil Revelations HD, can once again nail the perfect balance between action and survival-horror that it got so right last time. GamesMaster Magazine claims that the team knows this is a concern for fans, and Producer Michiteru Okabe is trying to both match the high expectations and surpass them. "The project has been finding the line between listening to fan feedback and also doing something different to confound expectations. I want this to be both a game that doesn't lose what made its predecessor great, while also bringing something new and exciting to the Resident Evil series.Achieving that lofty goal by bringing together past and future will make this an itchy-tasty prospect indeed." GamesMaster Magazine also says that the game will be running in 1080p at 60 fps on the PlayStation 4, Xbox One, and PC. PlayStation 3 and Xbox 360 versions are also in development.